When building a search enabled application, data can come from many places and take many forms, so making it easy to ingest a variety of data sources is extremely important. Bringing amazing search to your data just got a little easier. Today we're excited to announce preview support for Azure blob and Azure table data sources in the Portal. Make your Microsoft Office, HTML, PDF, and other documents searchable with just a few clicks in the Import Data wizard. We’ve provided simple user interfaces to pick accounts and containers from within your subscription. Perhaps you want to index blobs containing an Outlook email archive, or create a resume search application to streamline your hiring process. After selecting your data, we’ll detect your metadata fields and suggest an index. The blob indexer has the ability to crack open your documents and extract all text into the content field as well. We hope that these new data sources will enable some truly awesome experiences! For more information about indexers, see our articles on indexing table and blob storage through the API. 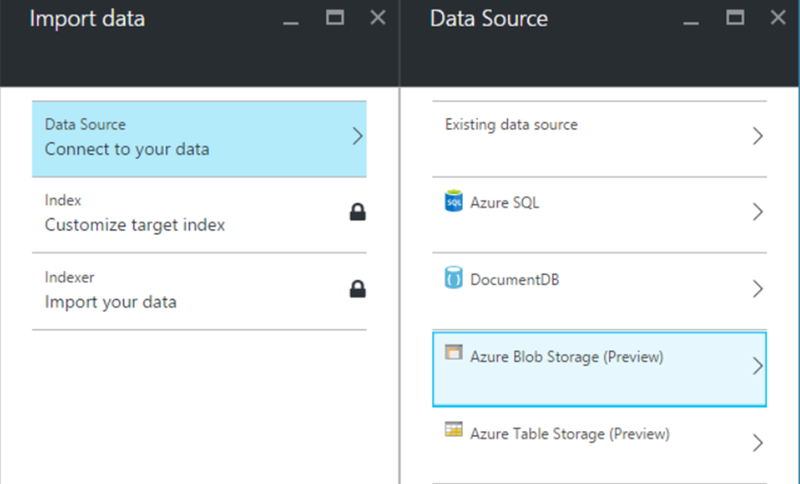 To get started with Azure Search in the Portal check out this article. If you have questions, please feel free to reach out in the comments below, or leave your feedback on UserVoice.